In a paper published in the journal Renewable and Sustainable Energy Reviews, researchers from Columbia University and the Risø National Laboratory for Sustainable Energy (Denmark) review the possible technological pathways for recycling CO2 into fuels using renewable or nuclear energy, considering three stages: CO2 capture; H2O and CO2 dissociation, and fuel synthesis. The authors claim that the process can be competitive with gasoline sold between US $2 and US $3 a gallon, depending upon the cost per kwh of electricity. 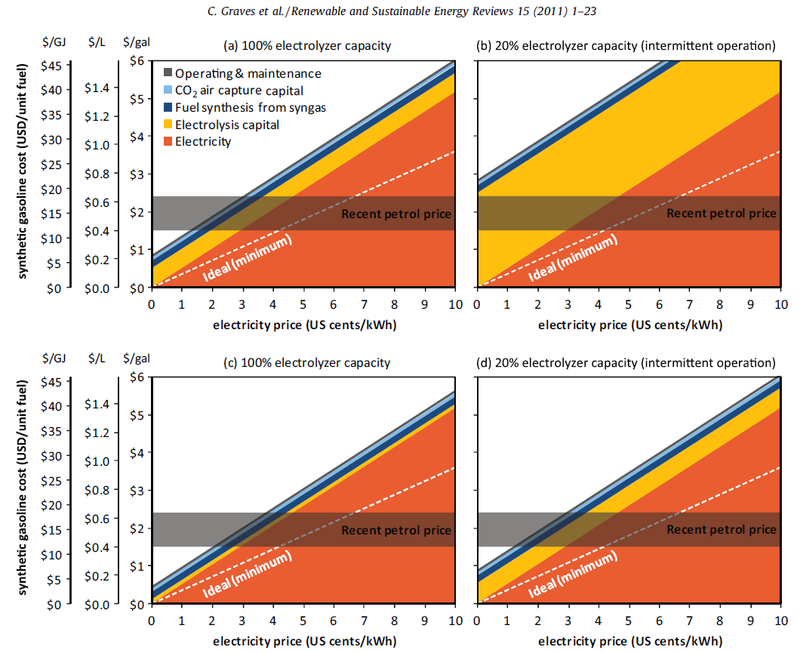 In reality, for this process to be competitive, electricity would have to be extemely cheap -- which rules out wind and solar as power sources. In the review, Grave et al. 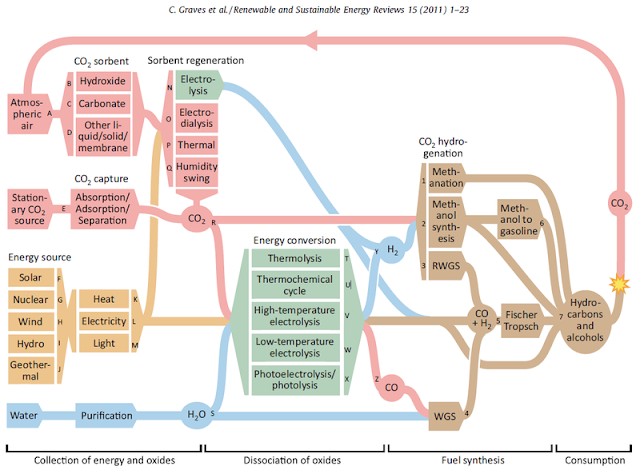 examine the status of the enabling technologies for each stage, with special focus on the various thermochemical, electrochemical and photochemical energy conversion technologies that could be used for dissociation of H2O and CO2, the stage with the highest energy consumption. They noted that combining more than one stage into a single unit is possible, but there may be benefits to optimizing each stage separately. 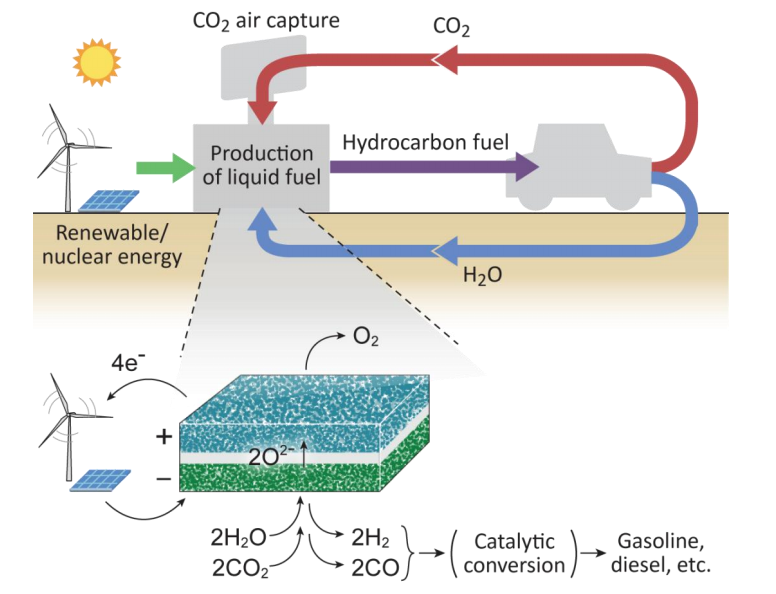 With feasible technology development and mass production of the process components, CO2-recycled hydrocarbon fuels can be produced at the scale needed to replace transportation fuels at a price competitive with more conventional fossil-derived hydrocarbons, especially if oil and CO2 sequestration costs are high. The potentially greater sustainability of CO2-recycled fuels over fossil or biomass derived fuels, as well as independence from the geographic and supply related issues of conventional fuels, could also give CO2-recycled fuels a market advantage. The image below is a fanciful representation of some EU bureaucrat's reality-disconnected daydream, but it provides a simplified and readily grasped summary of the underlying idea. As long as you know that wind power is much too unreliable and expensive to work in this scheme, and that atmospheric capture of CO2 is completely unworkable economically, you will be prepared to look at the images above for slightly more realistic approaches. Al Fin analysts have concluded that the only way such a scheme could work in the near to mid-term future, would be to combine a plant that creates significant concentrated CO2 with a dedicated modular fission plant for electric power, adding the components for SOEC electrolysis and F-T synthesis. Each step must be proven individually, then in an ensemble pilot project. For this type of project, theory is not enough to base a significant investment. All of the concepts must be proven individually, and then together, before attempting to scale up.